I've prepared a document I hope will be useful to those independently birding in Taiwan - a collection of phrases and vocabulary in Chinese related to bird-watching in Taiwan. sometimes for the latest on Mikado sightings! It can (I hope) also be downloaded as a Microsoft Word or PDF document here. Tell me what you think. Chinese Phrases and Glossary for Bird-watching in Taiwan. This is a selection of Chinese language phrases and terms that may be of use to foreign birders visiting Taiwan - and residents needing some more specific vocab. Note, some of the terminology, and form of characters used in China may vary slightly. Taiwanese warmly welcome foreign visitors. Many will speak quite reasonable English, others none, or may be very hesitant. Keep in mind good English speakers may not be familiar with birding-specific terms, or the daft needs of us birders! Many of these terms are rather technical - would most average people in bird-watching Britain understand? A bit of patience, sign language, and drawing goes a long way. Speak normally. Romanization is not taught in Taiwan - if possible show Taiwanese actual Chinese characters, not romanized language. Please note my suggestions are ‘common sense’ translations and may not alway be direct translations. I have romanized (that is - using ‘English’ letters to represent Mandarin Chinese sounds) all the phrases, use them in context and practice. Chinese is not as hard as some would suggest, have a go - you may be surprised! I’ve come to Taiwan to watch birds. Wǒ lái táiwān kàn niǎo. The term more commonly used in China is 觀鳥 Guān niǎo. Also 看 kàn (used above) is common. I want to see lots of different species of birds, not just lots of the same bird. Remember not everyone understands the concept of birding. I only want to see the birds, not photograph them. Wǒ zhǐ xīwàng kàn dào niǎo, ér bùshì pāizhào. Most birdwatchers here are photographers. I need to get up very early. Wǒ xūyào hěn zǎo qǐchuáng. We have this in my home country. I’ve seen this bird before. Wǒ kànguò zhè zhǒng niǎo. A polite reminder to be quiet. Your clothes are not suitable for bird-watching - too bright and noisy. I don’t need a tripod. Thanks. Please don’t use playback (tape) so much. A little is enough. Qǐng bùyào fàng zhème duō niǎo yīn. Be polite - and lead by example! Dogs are now not allowed in many forest reserves. Nǐ yǒu méiyǒu nǐ kàn dào dōngxi? A useful way of finding what others have found. Please don’t stand so close. Zhè tiáo lù guòdeqù ma? I will only be parked here for 2 minutes. Wǒ zhǐ huì tíng zài zhèlǐ 2 fēnzhōng. Sorry officer, it has been my lifelong dream to see this bird. Forgive me please. ...well worth a try. Taiwan police are very decent people. Do you know this bird’s call? I heard it but didn’t see it. Wǒ yǒu tīngdào jiào shēng, kěshì méiyǒu kàn dào. I saw it, need to see again. Taiwanese also use the English word ‘call’. Zhè zhǒng niǎo... Yǒu kěnéng chū xiànzài zhèlǐ ma? I write detailed reports when I go home. How many birds have you seen? Forest, bamboo forest, virgin forest, secondary forest, broadleaf, pine. Rice field, farmland, orchard, ‘empty land’, downtown. Mountains, reservoir, pond, marsh, lake. Plains, low hills, mid-elevation, high-elevation. Many ‘forest roads’ are excellent paved roads. Entrance, exit, end point, mid point, embankment (dyke). Essentially the same place as ‘Anmashan 鞍馬山’ - often seen in birding reports. Be sure to pick up the set of five excellent maps from tourist counters. Sometimes 小鳥 Xiǎoniǎo ‘small birds’. Trunk, branch, leaves, bush, grass, marshy weeds. Eye, wing, leg, foot, beak, feather, body, head. Waterbird, landbird, raptor, diving duck, wader, herons, seabird, gulls and terns, owls, ducks and geese, shorebirds. Insect, butterfly, dragonfly, moth, wasp. No need to worry about bears - they say well away from scarier humans. Fish, flying squirrel, tree squirrel, serow, muntjac. Scenery, culture, nature in general, shopping. Rain boots, SLR, record shot (photo). Mosquito, leech, cagebird, food, nature, banding. There is no malaria in Taiwan and dengue is rare. Leeches very rare. Cagebirds rare and declining. Literally heavy artillery. May be interchangeable with spotting scope. ‘niao you’ is a nice term describing fellow birders. Bird society, Forestry Bureau, national park, TESRI, environmental protected area. TESRI = Taiwan Endemic Research Institute. HK and China use the term 觀鳥會 for Bird Society. Feeding station, bird feeder, bird fair, bird hide. English name, scientific name, Chinese name. ...not good, average, very good. Combine with ‘niao-kuang’ above. 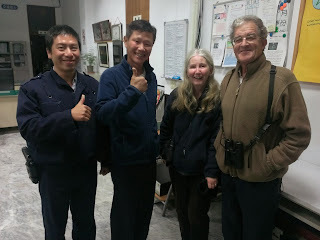 ie ‘niao-kuang hen hao’- the birding is good. i.e. Are there lots of good birds? Endemic/ Endemic subspecies, bird species. Resident, migratory, wintering, summering, introduced (exotic). Female, male, adult, juvenile, chick. 母鳥, 公鳥, 成鳥, 亞成, 雛鳥. Mǔ niǎo, gōng niǎo, chéngniǎo, yà chéng, chúniǎo. Nest, fruiting tree, biodiversity, next to road. On, in, under, middle of. Too far, too close, to disturb. Tài yuǎn, tài jìn, gànrǎo. Re. where access is controlled - completely, or accessible by signing in or paying toll. Possible reasons for birding here. Weather, rainy, cloudy, sunny, humid, hot. Mountain areas are sometimes closed before or after bad weather. With driver or guide maybe. Is it convenient to go here…? Zhè tàng xūyào duōshǎo fèiyòng? I will meet you here in...minutes/hours. ...depends on what birds I see. My itinerary may change. Drive. If I see anything interesting I will tell you to stop. Xiān kāichē. Rúguǒ wǒ kàn dào wǒ xiǎng yào de, wǒ huì gàosu nǐ tíng xiàlái. I need... rest, beer, accommodation, coffee. I need a bathroom. Sit-down toilet. The best time to watch birds is early morning and evening. I prefer to do the travel at night or in the middle of the day. I don’t need to have a fancy meal, a quick snack will be enough. Taiwanese do say thanks, you should too. This is an excellent all-round phrase of encouragement. Something to say in just about any situation. To see the best birds you probably notice this. Taiwanese appreciate hearing it. Fairy Pitta literally the ‘8-color bird’, often confused by non-birders with the 5-color bird’ the Taiwan Barbet. In China, BFS is 黑臉琵鷺 Hēi liǎn pí lù.